I love the water and the ocean so any park that offers unobstructed views of that is a place I want to go. San Simeon State Park is one of those parks. It is located along the Central Coastal Region of California, is one of the state's oldest parks, and has unobstructed views of the ocean and its rocky shoreline. There are 115 campsites available at San Simeon Creek campground inside the park. They are RV accessible as long as the length of the RV doesn't exceed 35 feet. A fire ring and picnic table is at each site with water available at various locations around the campground. The restrooms have flush toilets and showers, but the showers are coin operated so raid your piggy bank before taking an overnight trip there. Campsites can be reserved from March 15 to September 30 by calling 1.800.444.PARK. The rest of the year campsites are available on a first come first served basis. A second campground in the park, Washburn Campground, is for those looking for a more primitive camping experience. It is located about a mile inland from the beach on a plateau overlooking the Santa Lucia mountains and the Pacific Ocean. Each campsite has a fire ring and picnic table. There are also water spigots and chemical flush toilets in the campground. The park is located 35 miles north of San Luis Obispo on Highway 1. The town of Cambria is 2 miles to the south and has gas stations and grocery stores. From Los Angeles, it would be about a 4 hour drive North. -The San Simeon Natural Preserve (a wintering site for Monarch butterflies). It has a 3.3 mile trail running through it; with a portion of it wheelchair accessible. -The Pa-nu Cultural Preserve which has an archeological site dated to 5,850 years ago and which contains evidence documenting prehistoric technology. While in the area, take a short drive north and take a tour of the Hearst Castle. 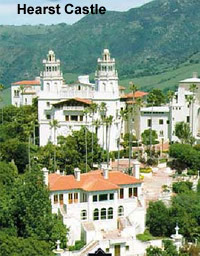 Hearst Castle is one of the largest historic house museums in the United States. It was a collaboration bewteen William Randolph Hearst and George Hearst, was originally known as "Camp Hill," and was a place for family members to "rough it" (that being a relative term) while on camping trips. The castle is almost 91,000 square feet, has 56 bedrooms, 41 fireplaces, 61 bathrooms, 19 sitting rooms, 1 345,000 gallon outdoor pool, and a 1,665 square foot tiled indoor roman pool. Tour reservations are highly recommended. For more information about Hearst Castle, click here. 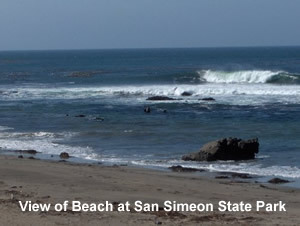 For more information about San Simeon State Park, visit their official website by clicking here. Here's some more pictures of San Simeon State Park. Click on the image to see a full sized version of it.